Photo from John Greening, no reproduction without permission. 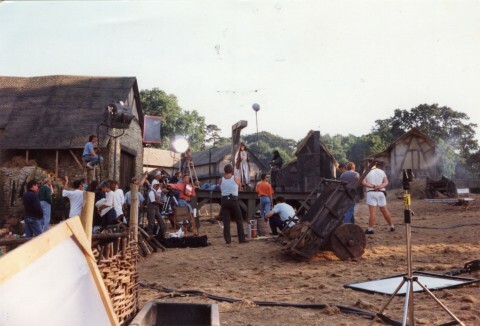 The photo is of the 1992 Pebble Mill drama series, ‘Witchcraft’, on location near Chipping Camden. Carol Parks was the producer, Peter Sasdy the director, screenplay by Nigel Williams. Barry Hanson was the exec producer. The story involves a film school teacher choosing the subject of 17th Century witchcraft for his latest script. Real life begins to take on ominous similarities to the happenings in the script. The series starred: Peter McEnery, Alan Howard, Lisa Harrow, Georgia Slowe, and Judy Campbell. From the comments of people who worked on the series, it was a somewhat challenging production.